Moving on with my Conan/Robert Jordan double-feature. . . .
With Conan the Unconquered, Robert Jordan’s third book in the series, the author seems settled with his style of writing the Hyborian Age. Some of the flaws in Conan the Defender are subdued, although the story is the average “meat ‘n’ potatoes” Conan pastiche material. The book has a feeling of comfort food: neither challenging nor surprising, but providing decent sword-and-sorcery entertainment. The plot of Conan the Unconquered follows the Middle Eastern fantasy playbook, set around the Vilayet Sea in the Kingdom of Turan, with an excursion across the waters to Hyrkanian lands. Conan is not yet in his twenties, and has arrived in the Turanian city of Aghrapur. A compatriot from his thieving days, Emilio from Corinth, approaches Conan with the offer to join in stealing a necklace from a compound outside the city. The compound belongs to the Cult of Doom, whose members may be responsible for many assassinations occurring in the city. (The Cult of Doom sounds as if Jordan is swiping from the recent movie Conan the Barbarian.) Emilio’s lover, Davinia, is the one who wants the necklace stolen. Conan no longer wants to dabble in thievery, but after the astrologer Sharak casts a chart for the barbarian, he changes his mind and seeks out Emilio from the stewpots of Aghrapur. As usual with pastiches, Conan has slender reason to stay in the story; the device of Sharak’s chart is a flimsy one (and Sharak as a plot device hangs around far longer than he’s needed) to keep Conan interested in the Cult of Doom and its necromancer leader Jhandar. Jordan manages to coax Conan into the story faster than in Conan the Defender with some sleight-of-hand that makes both Conan and Jhandar believe the other must die for them to live. Conan allies with a vengeance-minded Turanian sergeant, a group of Hyrkanians chasing after Jhandar for the desolation he brought to their land, and the beautiful Yasbet who keeps her parentage a secret. The action comes at a steady clip. Conan breaking into the compound and facing the resurrected body of a former companion is one of the highlights, and obviously inspired by “The Tower of the Elephant.” A naval battle on the Vilayet Sea is also exciting, but over too quickly. Some parts of the story eventually go nowhere, such as a sequence where Conan must enter a place called the Blasted Lands. This chapter doesn’t end up advancing the story, although it does pit the hero against a cyclopean slime-creature, which I think is its own reward. Jhandar turning noblewoman Lady Natryn into a dead slave in the Prologue is only meant to show how the necromancer makes his slaves to unleash inside Turanian households. I expected Lady Natryn to show up later, but she’s never mentioned again after this. As in Conan the Defender, Robert Jordan’s writing often seems to try too hard with forced archaic diction. I did a comparison with some of Howard’s passages dealing with similar situations, such as descriptions of taverns and city slime pits. I found that Jordan’s descriptions stack up the adjectives far higher than Howard ever does, yet Howard manages to make his setting more vibrant. If you want to try this test yourself and have copies of both Conan the Unconquered and Howard’s “The Tower of the Elephant” on hand, compare the opening of Chapter II of Jordan’s novel with the first paragraphs of Howard’s story. Jordan’s writing is good, although a bit over-decorated. Howard’s writing feels period-appropriate while seeming effortless. The problem is perhaps that Jordan’s writing comes across like an over-imitation Howard, which makes me long for John Maddox Roberts’ transparent style that makes no attempt to ape the original, and ends up better for it. However, Jordan’s writing isn’t bad despite its flawed approach to evoking old pulp prose. Even if it draws attention to itself too often, it still moves forward steadily and takes the reader along with it. The more florid writing ebbs during the action sequences and eventually tapers off, making the writing in general superior to that in Conan the Defender. One of the book’s biggest weaknesses is its women. They’re basically trivial. Yasbet is foolish, and Davinia is only a misguided seductress. The book’s silliest sequence has Conan somehow able to train Yasbet to best a rough sailor in a sword fight after giving her three minutes of verbal instruction. The women also swoon too easily over Conan, hurling themselves to his sexual prowess as if he were a Gary Stu. I dislike the way Jordan sometimes interprets his inherited main character. Conan acts overtly deceitful, and often comes across as a bully — the honest but tough, and occasionally naive, barbarian I would imagine at this age isn’t here. The way Conan manufactures a story to scare a poor girl in order to keep her from taking a message that may make his life difficult is wrong for the character, and his sexual bullying with Davinia is also “off” (I can see it happening in a hallucinogenic work like “The Frost Giant’s Daughter,” but not here). 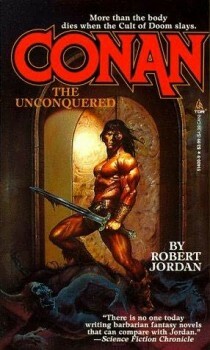 Ultimately, Conan the Unconquered reads fast. Many pastiches I’ve read have required molar-grinding determination to get through, dragging my way along them simply so I can reach the words THE END and write the review. But I moved through Conan the Unconquered in an unfussy three days, and could take in large numbers of chapters at one sitting. That’s a high compliment to any book in the pastiche series. My first-edition paperback copy contains numerous errors, such as twice writing “Hyrkanian” as “Kyrkanian.” I imagine that later printings corrected these mistakes. I will be traveling in Germany for the next two weeks, so I will probably be absent from my normal Tuesday duties next week and will come back on the twenty-ninth. Have a good holiday season, everybody. May Mitra makes your days merry and bright, and may Crom not notice you.